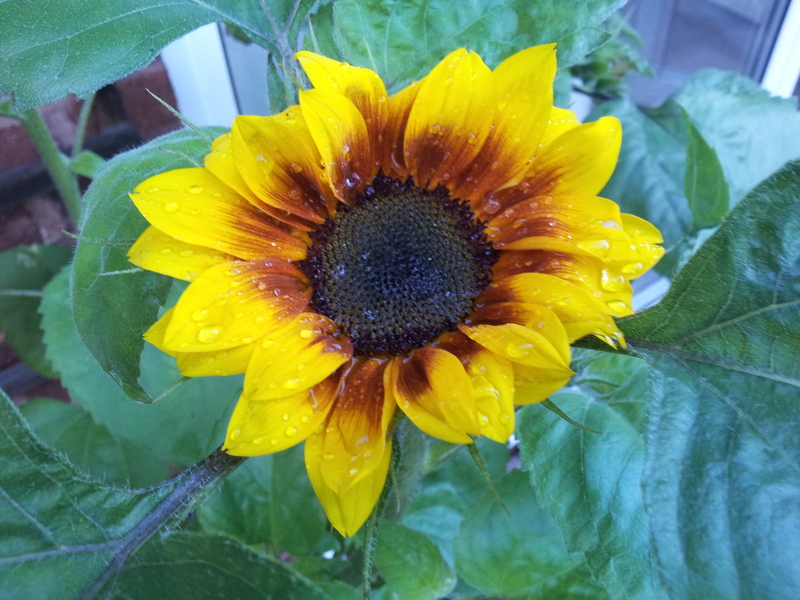 My beautiful sunflower, which I planted in our new garden in May, has finally started to emerge. I love sunflowers. They are so beautiful and cheery. They adorned the tables at our wedding. I love yellow. This variety is not a tall, thin one but a bushy variety about five feet high. This was the first flower head to bud, and there are about half a dozen others about to spring forth into glorious yellow life. I feel really proud of this pic, if I say so myself, considering it was just one I snapped quickly on my mobile. I love the detail on it, like the raindrops. It reminds me of one of those screensaver pictures you get on your computer. It almost looks unreal. I love retro journeys to my childhood – like watching Hi-De-Hi (my favourite programme when I was five) on YouTube – and I am currently rereading Anne of Green Gables, which was my favourite book as a young teen. My dear granny – a writer, like me (and indeed Anne herself) – introduced me to the “enchanting red-haired orphan” when this Canadian classic was televised at the end of the 80s. I fell in love with the TV series (the Canadian actress Megan Follows truly embodied the spirit of our heroine) and thereafter the LM Montgomery novels. Following my recent house move, my very dog-eared collection of the entire series – Anne of Green Gables, Anne of Avonlea, Anne of the Island, Anne of Windy Willows, Anne’s House of Dreams and Anne of Ingleside – was unearthed from my mum’s house, with the objective of rereading them all with adult eyes. Now I am back in the company of Gilbert Blythe, Matthew and Marilla, kindred spirits, Avonlea Story Club and the White Way of Delight, and am being captivated all over again. They are not strictly children’s books, in the sense that LM Montgomery’s style is droll and non-patronising. She deals with adult themes such as marriage, bereavement and loneliness. Anne (spelt with an e) is a true icon. Her quirky appeal is timeless. They are such wholesome stories. Nearly everyone in them is nice. My reading matter is very eclectic; I love a good murder (in fiction, that is!) just as much as I love chicklit, Harry Potter or a biography. But there is always room for something a bit more innocent. As I say, my books are very tattered – but then it’s true that the tattiest books are the most read. Somehow having to hold the book in a certain way to prevent the yellowing pages spilling out only adds to the fun of the experience. Old books are friends to me (which is a very Anne-ish thing to say). Even the smell of the ink on the pages is so evocative. The food the characters eat, the clothes they wear, the flowers that grow in Avonlea are as vivid and appealing as when I was a kid. When my first nephew was born, five years ago, I began a tradition, gifting him with a classic novel (inscribed from Aunty Leigh and Uncle Nathan) for his first Christmas as a future heirloom. I have continued this custom with my three subsequent nephews and niece, and this year another niece has arrived, to whom I intend introducing to Anne’s adventures.